Home > North America > United States > Where Do Leaders Come From? In 2017, ATD Fourth World invited people from around the world to document real-life “Stories of Change” arising from situations of injustice and exclusion caused by extreme poverty. These stories, from activists, community leaders, and others, show that when people work together, real change can happen. More about the “Stories of Change” blog. In New York City, a young mother finds a community center that offers just what she needs to move forward in life. A young woman named Toni came to the community center where I used to work, asking for money to feed her children. We did not have cash on hand to help her. We gave her a tour of the center instead, describing the computer area and the dance and piano lessons available. We told her that we had an open mic night with guest artists and a potluck dinner once a month. She was so excited to see the computer area. And maybe she could read a poem or one of her short stories at the next open mic? Of course! After that she started coming in every day with her computer and she would write and write. Several board members complained that her then seven-year-old son was watching TV all day in the center. More complaints from board members came in when Toni stayed all day while other neighbors and residents only occasionally used the computer area. As the center manager I was under pressure to control how many free hours of internet Toni used, how long her son could stay and watch TV. Sometimes she left him by himself while she went home to take care of her elderly partner who could not work. There was also pressure to bring in more people to use the space. Nevertheless, it was clear that Toni was looking for work and trying to improve her situation — she regularly asked us for help with her resume or cover letters. One day, Toni explained that coming to the center gave her space to think. She said that she told her family, “Mommy’s going to work at the center.” She came every day, staying until closing time, mingling with residents and other members and working on her computer. One open mic night, Toni read a story and everyone was moved. She read three poems, too. She asked everyone to be ready for the release of her first book of poems, to be published online. It seemed that indeed she was working, just not for any wages. As the months rolled by, Toni kept coming to the center. She asked us to proofread her book. At the next open mic she sang a poem in blues style. What a voice she revealed. Her son was there in the audience, and her teenage daughter and her friend came to see Mom’s work. For someone living in poverty with the stresses of raising a family combined with her determination to keep working on what she was passionate about, Toni had a gift for networking. This was revealed when she came up with the idea to have the open mic every week. Toni got tablecloths, candles, and curtains to transform the open studio into a jazz club. 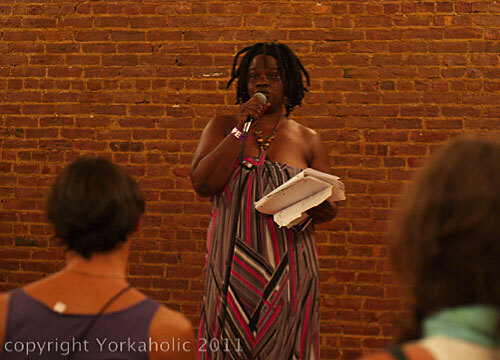 Her initiative was so appreciated because, after being in the center all the time and connecting with like-minded musicians, poets and artists, she believed that the community needed a club to share their art. Just as those of us who worked in the center believed that an under-served community needed an open mic and exposure to various artists from outside “the hood,” Toni believed that we needed to go one step further and have a weekly get together to hear what was being produced locally. Toni managed all the preparations. On opening night, the Board members came and changed their minds about how the space was used. The Board had been concerned that the center resources were not being used properly. However, on this evening they experienced the results of people having space and time to grow artistically. This happened because, without anyone realizing it, the center had nourished a new leader in the community. One Board member offered to coach Toni on how to develop an audience and bring in donations. The Board member explained that if we charge admission, the musicians and poets could earn some money, and maybe Toni could get something for her organizing. That was the beginning of a new change for both the community center and for Toni. Today, you can see Toni has published her book. The title, “From Me to You,” shows her heartfelt vision to share through poetry what inspires her in life. To listen to this story.